Broccoli or calabrese or 'little sprout', sometimes known as green cauliflower in India. It is a delicious vegetable, boiled, made into a bhaji, cooked in a cheese sauce or filled in parathas. Do not overcook it, or you will loose the flavour. Here I have cooked it with a lot of onion. You can make it with less onion or even without onions. The word 'pyaza or pyaja' means with onions and 'do', pronounced as doe, means two or double. So, this dish has a lot of onions. I tend to use roughly same amount as the broccoli by volume. 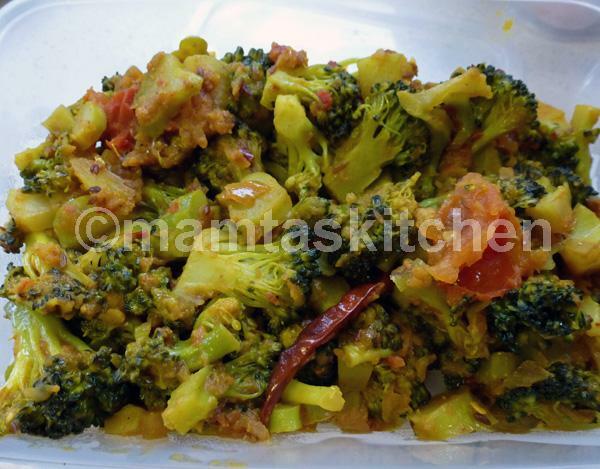 It is a nice vegetable dish to serve as a side dish with a dal or meat. When tomatoes are in season, you can add a couple of wedged tomatoes at the end of cooking and stir them in. Prepare, wash and drain broccoli and keep aside. Add cumin seeds or mustard seeds or panch-pooran seeds, as per your choice, and asafoetida powder. When seeds crackle or splutter, add whole red chilli, stir a couple of times. Add ginger and garlic. Fry for 10-15 seconds. Add onions and fry until just getting soft and semi-translucent. Add broccoli and then all the spices, except garam masala and mango powder/lemon juice. Stir fry for a minute, until vegetables are well coated with spices. Lower heat to low-medium. Cover and cook until tender, but not mushy. Broccoli should retain its crispness (al-dente). Add garam masala, mango powder/lemon juice and mashed up lime/mango pickle. If it looks watery, raise the heat and quick fry until all water is evaporated. The vegetable should look at little shiny, when ready. Plain Parathas and a dal/curry of choice. If the vegetables are fresh and the heat is correct, you do not need to add any additional water. Selecting correct heat comes with practice, trial and error. It should be simmering very gently, otherwise vegetables may 'catch'. If you need to add water while cooking, sprinkle 1 tablespoon at a time. This will prevent vegetables from going soggy due to overcooking in your attempt to dry off the excess water.